SF Taxi Media: Taxi Driver Who Struck Bicyclist Did Not Run Red Light. Windshield Mounted Camera Gives Proof. By John Han.. Taxi Driver Who Struck Bicyclist Did Not Run Red Light. Windshield Mounted Camera Gives Proof. By John Han..
Janus V2 windshield mounted video/audio recorder by 3rd Eye Cam. It has been confirmed that the taxi driver who reportedly ran a red light and struck a bicyclist, may be exonerated, and deemed innocent of the allegation. For those who haven't read, on Sunday, October 30th, at about 2am, a driver of a Town Taxi struck a 22-year old bicyclist, at the intersection of Cesar Chavez and Guerrero streets. The accident reportedly left the bicyclist with head injuries that are considered to be life threatening. According to the SF Examiner, a police spokesman said that the taxi driver ran a red light heading eastbound on Cesar Chavez St., while the bicyclist was traveling southbound on Guerrero. While the incident is tragic, it would be even more tragic to incriminate the taxi driver for running a red light, if in fact he is not guilty. Jacob Mayzel, manager of Town Taxi, says video captured by the taxi's window mounted camera proves the taxi driver actually had a green light. Mayzel confirmed this with Taxi TownSF, but did not comment further on the accident, citing that it's investigation is not yet complete. 3rd Eye Cam is the San Francisco based company that manufactures and distributes the cameras, now mounted on the windshields of most taxicabs in the City. And while the company markets the benefits of their product mainly to owners and fleet managers, protection from cameras extends to drivers as well, as would be evidenced in the Town Taxi incident. 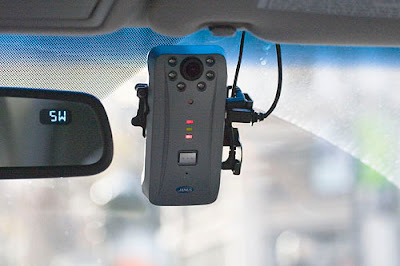 The controversy for some drivers is whether continuous video recording invades their privacy, since the cameras record not only the forward view, but inside the cab as well. Some feel strongly that that is intrusive. Others say they don't mind so much, and may even feel more secure. In my opinion, both are valid viewpoints. Here's what California's vehicle code 26708 says with respects to videos, as it pertains to San Francisco's taxi industry. I have done as much as highlighted in bold text, what may be the key issues. "(13) (A) A video event recorder with the capability of monitoring driver performance to improve driver safety, which may be mounted in a seven-inch square in the lower corner of the windshield farthest removed from the driver, in a five-inch square in the lower corner of the windshield nearest to the driver and outside of an airbag deployment zone, or in a five-inch square mounted to the center uppermost portion of the interior of the windshield. As used in this section, “video event recorder” means a video recorder that continuously records in a digital loop, recording audio, video, and G-force levels, but saves video only when triggered by an unusual motion or crash or when operated by the driver to monitor driver performance. (E) The data recorded to the device is the property of the registered owner or lessee of the vehicle." "The Janus is a drive camera safety device that can be used in any vehicles for recording incidents from inside and outside the vehicle, as well as, audio. Motion-sensor technology is used in the cameras to record and save footage of accidents and other traffic incidents. It has infrared laser light emitting diode for night driving and audio. An emergency button is included allowing users to record in an instant. The system is programmed to save recorded data when prompted by an unusual or sudden movement of the vehicle. During an incident, the system will instantly record within eight seconds before and four seconds after the incident occurs. Motion sensor technology senses movement such as, swerving of the vehicle, abruptly halting through stop sign intersection, or when it is struck by another vehicle. Also, the system records 24 hours a day, 7 days a week. All recordings are recycled over time until an incident occurs. The time, date, speed and location of the incident is recorded and placed on Google Maps." Thus far, it would seem to me that the Janus V2 cameras are for the most part in compliance with California's law. But I'm no attorney. If there are areas in which they are not, some one who knows should say so. To drivers most adamant about privacy, I'll give it this - the law is vague and open to interpretation. For example, it says "video event recorders" may record continuously in a digital loop, but doesn't specify how long the loop may last. So if Janus V2s are set to continuously record in 48 hour or 72 hour loops or longer before recycling, it would seem to still be in compliance, since the law has no apparent maximum for loop times. I can see where that could become a privacy concern. Not everyone wants to be potentially examined every minute of their working lives. But where the cameras may be in violation of the laws may not be in the product itself, but in the way cab companies are administering them, perhaps. For example, some cab companies have clearly communicated to their drivers that they reserve the right to terminate drivers for disabling Janus V2s. "(D) The registered owner or lessee of the vehicle may disable the device." That said, I personally will not tamper with the cameras, for reasons such as the Town Taxi incident. These cameras continue to prove their value to the industry. However, I do not want to be audio recorded. I know some disagree. But to me, that's creepy. Also, as a crime deterrent, it's not known how effective they are, given the concerning number of robberies committed against cab drivers this year. Because of the number of crimes this year, additional measures beyond the use of cameras should be looked at, for purposes of crime prevention. the cameras may be hooked up to record 24/7 but most people only have them working when the car is running. One co. had it 24/7 and there was an accident and cops towed the cab. By the time co. got it back all the accident video was recorded over. to enhance the knowledge of the readers.